Don’t let people leave your special event hungry. 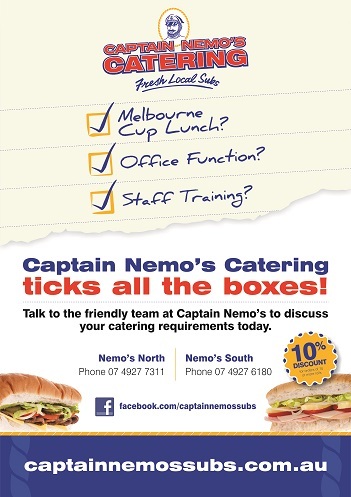 Let Captain Nemo’s cater for your work or social event. Order anything from our menu for your business meeting, sporting event, work function or even a night in watching the footy. All we need is 24 hours’ notice! If you order more than 10 rolls you will receive 10% off your entire order. Let us know how many people you’re catering for and we’ll tell you how many subs you need. Call us today and place your order.